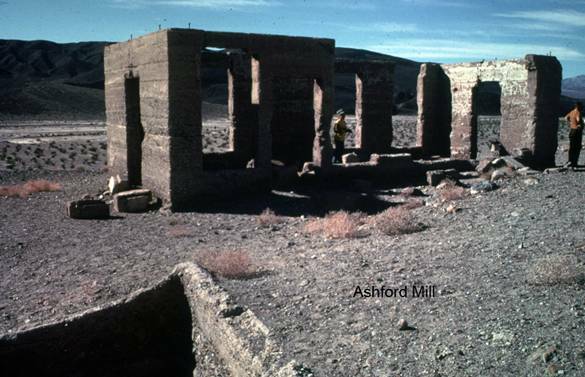 (35o 55.135’N, 116o 40.995’W) Ashford Mill, which also has a good view of Shoreline Butte is just west of the main eastside paved road in southern Death Valley. It is about 27 miles west of Shoshone and about 45 miles south of Furnace Creek. It is clearly marked on nearly all maps of Death Valley. Best Time: All year. The shorelines are best viewed in the late afternoon. Geology: The Ashford Mill processed gold for a very brief time in the early 1900’s. The source was a mine in the southern Black Mountains to the east of the site. There is a road that ascends the alluvial fan east of the main road but it soon stops and access to the mine itself requires a steep hike of several miles. From the mill site, one can look east and view the Pahrump group of Precambrian rocks well exposed on the mountain front. Farther north, one can see the Black Mountain metamorphic complex which makes up the bulk of the Black Mountains and are the oldest rocks in California. The view to the west is Shoreline Butte. Shoreline Butte is a badly eroded basaltic cinder cone that has been shaped by wave erosion from Pleistocene Lake Manly. These shorelines (wave benches) are clearly visible from the parking area at the mill site. Depending on the time of day and shadow angles, the shoreline may actually be clearer if viewed from about 1.3 miles north of the Ashford Mill. The elevation of Shoreline Butte is 663ft and the most obvious high strandline is at an elevation of 285ft (Sharp & Glasner, 1997). Thus from this location, since the floor of Death Valley at Badwater is 282ft below sea level, Pleistocene Lake Manly must have been at least 567ft deep. For a good comparison of age and level assessments over the years, please see Machette, et. Al. (2001, p. G146). Lake Manly was fed primarily by local runoff. It was probably connected to the Owens River via the Panamint, Searles and Indian Wells Valley in the Illinoisan but probably not in the Wisconsin Ice ages (Adams and Redwine, 2007). Phillips (2008) states that there may have only been one or two connections of Lake Manly with the Owens Valley system at about 70ka or 150ka. Between the parking area and Shoreline Butte lies the floodplain of the Amargosa River which on rare occasions flows this far downstream.